Cardinal XC runner Corey Lenhart at the start of the Class 5A Girls State XC Meet in Edmond -- Jim Riley (Saturday 10/29/2011) -- sent a few minutes after the 10am Sat. start. Four Collinsville XC Lady Cards Finished In the Top 10 (automatically earning All-State honors). In the red warm up suits L-R: Haylie Kirby (8th), Shelbie Kirby (7th), Haley Taylor (6th) and Coree Lenhart (4th). 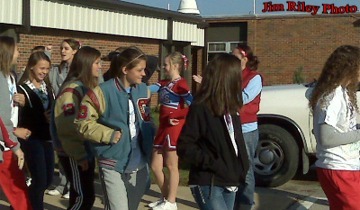 XC Team leaves for State XC meet in Edmond on Sat. Girls race starts at 10:00. Boys Race starts at 10:45. CHS Girls Cross Country Coach Arlin Stacy poses with the 2011 5A Girls Runner Up Trophy and Collinsville's top two finishers (both seniors) Coree Lenhart (left) and Haley Taylor (right). Without the photos above provided by Jim Riley and Pat Nicholson, I would have had none, as I spent a few hours in Stroud (waiting for a new alternator) instead of taking photos of the XC State finals in Edmond this morning. 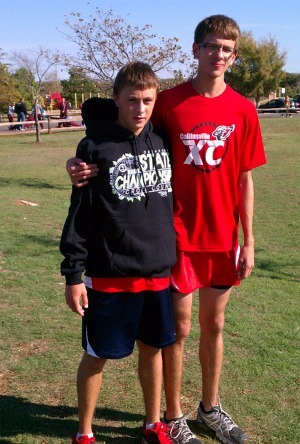 I just wanted to congratulate David Stellfox and Zach Ussery on getting to compete in the XC State Meet. These two guys were the leaders of group of hard working gentlemen. I appreciate all of their efforts.